Oshkosh residents staged a patriotic play at the city's Old Masonic Hall at an unknown date during the American involvement in World War I. During World War I, civic life in the United States often centered around what civilians could do to help the war effort. Growing and conserving food was one such encouraged practice, as was producing medical supplies for the troops. Whipping up patriotic fervor through speeches and rallies was also common, in rhetoric and campaigns that were often accompanied by anti-immigrant sentiment. The "home front," as these and other activities are called, can provide an under-appreciated window into history. University of Wisconsin-Milwaukee history graduate student Amy Fels discussed this domestic experience during wartime in an October 28, 2017 talk at the World War 100 conference in Madison. "Home fronts really developed for the first time in World War I because it was a total war," Fels said in the talk, recorded for Wisconsin Public Television's University Place. "It's discussed on broader national scales, but we don't ever really look at it in terms of a very locally focused perspective." To take a closer look within Wisconsin, Fels investigated how the home front played out in Oshkosh. The primary resource for this research was the archives of the Oshkosh Northwestern, a newspaper that was founded in 1860 and began daily publication in 1868. Given its mix of local, national and international coverage — the Northwestern was the first Wisconsin paper outside of Milwaukee to carry Associated Press updates — what it did or didn't publish about World War I can offer hints about evolving public attitudes toward American involvement. Oshkosh residents held a pro-war parade on April 27, 1917, just three weeks after the United States officially entered World War I. This research also revealed how the war effort shaped Oshkosh's social life. Civilian campaigns on the home front became opportunities for residents to display their support for the war, but also to attack people they saw as suspiciously foreign or insufficiently patriotic. It's a story that encompasses the impact of a community pulling together, and the dark side of wartime fervor. "To better understand Oshkosh's extensive home front activities, the city is best considered as this microcosm of enthusiasm within an equally active and complex state," Fels said. Before the U.S. entered World War I in the spring of 1917, the Oshkosh Daily Northwestern carried some reporting about the conflict in Europe and elsewhere, but did not cover it very extensively, largely filling its pages with l stories about local and national matters. In fact, coverage of the Great War initially took a backseat to stories about U.S. military action at the border with Mexico. The Northwestern's coverage portrayed Germany and Kaiser Wilhelm II as aggressors, and didn't directly criticise President Woodrow Wilson, but until the U.S. entered the war, the paper's coverage of the conflict remained relatively even-handed. But in the early months of 1917, before the U.S. officially declared war on Germany, the Northwestern began to openly advocate for the nation to remain neutral in the conflict. After the declaration of war on April 6, 1917, the paper shifted yet again to take a pro-war stance. One example of its editorial position was to run a patriotic poem titled "The Voice of Washington" that framed the war as a way to finish a quest for liberty that had begun with the American Revolution. Public attitudes in Oshkosh about the war were nuanced. In one local event the paper covered in August 1914, a local Lutheran pastor expressed support for Germany. Later that same year, the Oshkosh chapter of the German-American Association took up donations to help German and Austrian war widows. These stories reflected nascent tensions between Oshkosh's German-American population and the rest of the community. Once the U.S. entered World War I, Wisconsin acted swiftly to take part in home front activities. It was the first state to organize a "council for defense," which coordinated activities in support of the war, doing so less than a week after the declaration by Congress. It became a model for other state-level defense councils. Wisconsinites also rapidly conducted Liberty bond drives, and organized historic-preservation efforts to document state-level wartime activities. 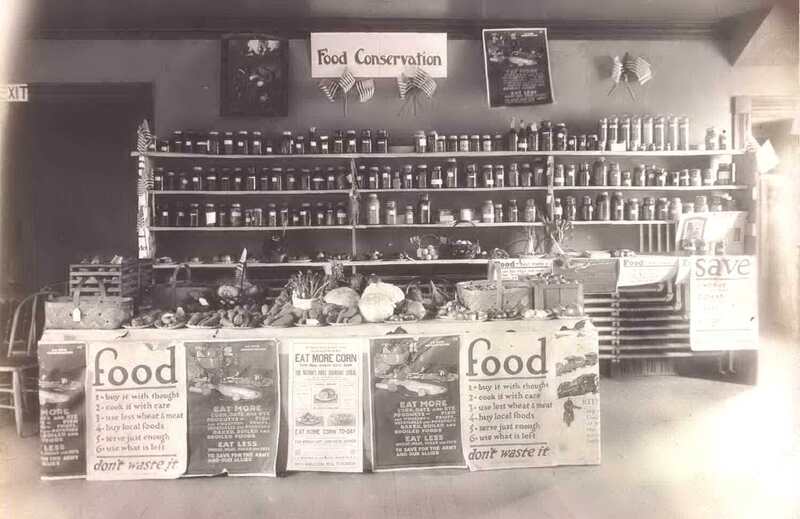 Exhibits like this one at Armory Hall in Oshkosh promoted food conservation as a patriotic duty amid the war effort. 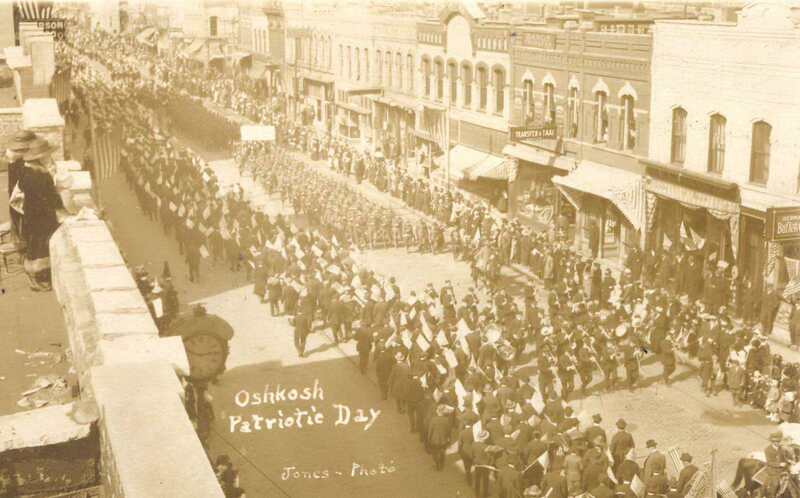 Oshkosh residents enthusiastically took part in home front activities, including a patriotic parade three weeks after the U.S. declaration of war. About 15,000 people participated in the parade. Supporters of the war stirred up anti-immigrant sentiment, and groups such as the American Protective League engaged in officially sanctioned efforts to harass German immigrants suspected of anti-war or unpatriotic attitudes, most of whom did not hold such perspectives. Additionally, groups like a local chapter of the Wisconsin Loyalty Legion harassed Oshkosh residents who didn't sign wartime pledges or donate money to home front causes, accusing them of being pro-German or socialist. The Northwestern participated in these persecutions by promoting the idea that people who didn't take part in certain patriotic activities posed an anti-American threat. One of Oshkosh's most active home front organizations was the local Red Cross chapter. Its activities included aid for soldiers, like creating hundreds of "comfort kits" for troops, with items like toothbrushes, soap, and paper and envelopes for writing letters. Social events became key to home front efforts in Oshkosh. They were often used as fundraisers for the Red Cross and other organizations supporting the war effort, and served dual functions as a social outlet and a platform for citizens to display patriotism. Children were recruited into home front efforts in Oshkosh through multiple organizations. Members of the Oshkosh Girls' Club helped the Red Cross knit clothing and create surgical dressings, and the Boys' Working Reserve encouraged its members to contribute to the war effort with a Boy Scouts-style system of badges and rewards. Food was a major focus of the home front effort. Public-education campaigns and even special recipes encouraged Oshkosh residents to reduce food waste and avoid using ingredients that were in short supply. Additionally, able-bodied men who didn't go off to war volunteered to work on local farms. On early coverage of World War I in the Oshkosh Daily Northwestern: "Although interest in the European conflict seems to have been relatively high prior to the United States entering World War I, evidence of widespread home front activity in Oshkosh is minimal. The headlines of the Daily Northwestern are filled with updates about the current conditions in Europe and negatively characterized Germany as an aggressor." On shifts in the Northwestern's coverage of the war: "Once the conflict with Mexico ended and the threat of entering the world war became more prominent in the opening weeks of 1917, the individuals behind the Daily Northwestern became much more vocal in expressing their desire for neutrality, writing 'that the United States safely may pass through this crisis without becoming involved in the war maelstrom is the sincere hope of every patriotic citizen.'" On jingoism and xenophobia in the home front: "The existence of anti-German sentiment or nearly fanatic patriotism in many areas across the state manifested itself through organizations like the American Protective League and the Loyalty Legion. While the APL was technically a vigilante organization operated by volunteers, it was given official consent by the Department of Justice to take action against individuals thought to be pacifists, German sympathizers or spies, or individuals harboring anti-war ideas that posed an apparent threat to the American war effort." 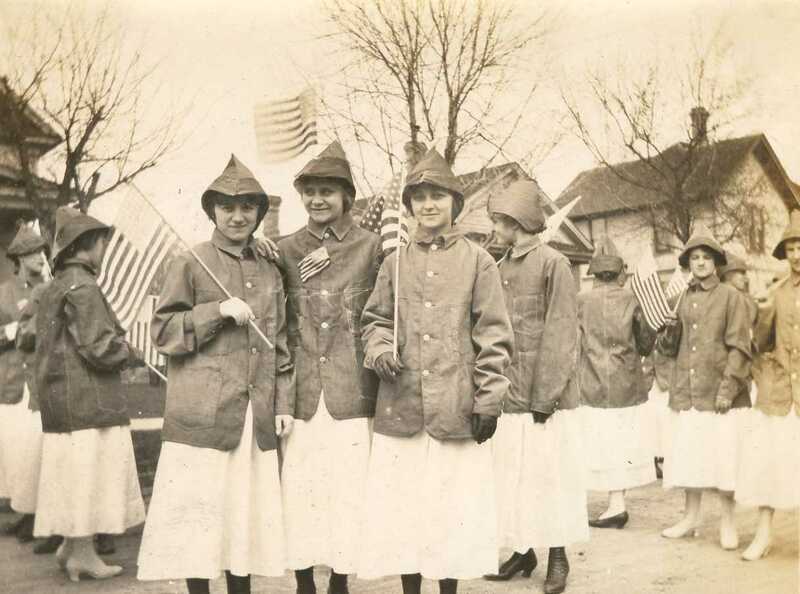 Parades and social events gave Wisconsinites, like these Oshkosh B'Gosh workers, a platform to display patriotism during World War I. On shifts in the Northwestern's coverage after American entry into the war: "The world war that was once to be entirely avoided if possible suddenly became 'a fight for all humanity' in which the 'democracy of the world was to be vindicated' after the United States declared war on April 6, 1917. Patriotism no longer meant hoping to maintain neutrality. Instead, it meant mobilizing the home front as quickly as possible to provide the greatest contributions to the American war effort." On the efforts of the American Protection League: "Between 1917 and '18, they filed more than 300 reports with the national government, against individuals they believed who held these tendencies. But the overwhelming majority of these accusations were found to be unfounded." On the broader lessons of home front history in Oshkosh during World War I: "The wide variety of events covered in advertisements published in the Daily Northwestern suggests that the opportunities to contribute to the war effort were made accessible to all members of the community, which is perhaps what made Oshkosh's home front so active and effective, whether positively or negatively."